Before the curtain went up I was dubious, to say the least, regarding a theatre production’s scope for inflicting genuine fear on its audiences. However Stephen Mallatratt’s adaption of Susan Hill’s iconic novel ‘The Woman in Black’, shattered any misconceptions with a tense and chilling theatre experience. The play’s first half involves a quivering yet amiable solicitor, Arthur Kipps, played by David Acton, attempt to recite his story to a highly charismatic actor, played by Matthew Spencer. The pair engage in a long spell of dialogue debating on how Kipp’s seemingly traumatising account of recent events should be delivered. The actor presses for entertainment and high drama, whilst Kipps protests his simple longing to find comfort in telling this story honestly in an effort to find peace within himself. The dialogue is often comedic, but feels slightly slow and aimless within a production where the audience is anticipating fast paced thrills. As the play progresses it quickly becomes apparent that this drawn out sequence of to’ing and fro’ing was simply a tool to lull the audience into a false sense of security, and make what was in store far more sinister. Soon enough the gentlemen’s reenactment and reality becomes indefinably intertwined. Praise is specifically awarded to David Acton who seamlessly embodies a variety of characters that came into contact with Kipps- a role the actor has adopted. As the narrative becomes more jumbled the audience are struck by scares which are genuinely terrifying. Gareth Owen’s sound design brilliantly creates startling tension as well as blood curdling moments of sickly surprise. Screams and gasps echoed around the theatre as people cower into each others shoulders, often laughing nervously after a sinister moment has passed, it is an impressively unifying spectacle. The simple set allows for the tension, as well as the audience's imagination to take centre stage. The utilisation of screens, doors and smoke frames the ghoulish cloaked woman in black, leaving her presence lingering long after she has disappeared from sight. The intermittent appearance of this figure affirmed the potential that theatre has to ripple fear through your blood stream. She was in the room with the audience, alive and moving, her screams completely engulfing you; it was no wonder the audience find themselves sneaking paranoid glances behind them, checking she wasn’t lurking in the shadows. It was a new, uncharted realm of fear that it is entirely exhilarating. Robin Herford’s production is undoubtedly entertaining, relying heavily on its skillful production techniques to create a very unique trip to the theatre but some of the important elements of the play itself were slightly obscured. The story essentially meditates on grief, yet these more poignant aspects failed to resonate with me aside an overwhelming sense of sheer terror. The show is a very harrowingly entertaining display of a performer/spectator relationship, however misses the mark in terms of depth. 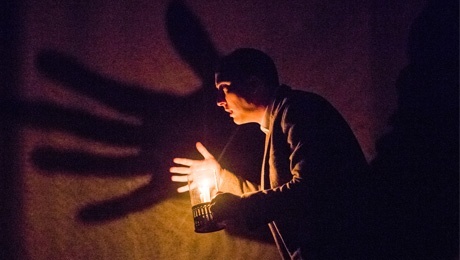 The Woman in Black is at the King's Theatre until Saturday 21st January. For tickets and information visit the King's theatre's website.